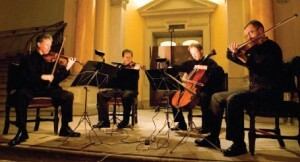 Winner of the 1988 London International String Quartet Competition and now in its twentythird concert season, the RTÉ Vanbrugh Quartet is one of Europe’s most successful quartets, internationally recognised for its beauty of sound, clarity of texture and integrity of interpretation within an unusually wide and varied range of repertoire. Appointed Resident Quartet to RTÉ in 1986 and with almost 700 performances in Ireland to date, the group has dedicated itself to bringing the wonders of the string quartet repertoire to audiences throughout the country. At the same time they have built a thriving international career, with regular tours taking them throughout Europe and the USA. As part of the RTÉ Heaney at 70 celebrations, RTÉ Performing Groups commissioned three composers to write short pieces for the RTÉ Vanbrugh Quartet in response to Seamus Heaney’s work. The pieces were premiered on Easter Monday with Seamus Heaney introducing each piece by reading the poem that inspired it. The “Beliayev Fridays” were a feature of St. Petersburg’s music scene in the late 19th century. With composers including Rimsky-Korsakov, Tchaikovsky, Taneyev and Skryabin in attendance, the music-making usually went on until the small hours. Notes have been preserved in which Mr. Beliayev, a well known patron of the arts, set down precisely the programmes of his musical parties. Usually, four or five quartets were performed, augmented with several instrumental pieces and some piano music. Compositions dedicated to celebration days, creative impromptus, and musical gifts were often a result of the joint efforts of composers of the Beliayev Circle. “The Fridays” have since become a popular collection of musical surprises and offerings that were presented at some of the parties.